Nelson J. Perez was born in Miami, Florida, on June 16, 1961 to David and Emma Perez and is the brother of the late Dr. David Perez and Louis Martin Perez. He was raised in West New York, NJ. Bishop Perez earned a Bachelor of Arts Degree in Psychology from Montclair State University in 1983. He taught at Colegio la Piedad, a Catholic elementary school in Puerto Rico, prior to entering Saint Charles Borromeo Seminary in Philadelphia, where he earned Master of Divinity and Master of Arts in Theology degrees in 1988 and 1989, respectively. Bishop Perez’s first assignment after ordination to the priesthood was as parochial vicar of Saint Ambrose Parish, Philadelphia (1989-1993). He also served as assistant director of the Office for Hispanic Catholics (1990-1993), founding director of the Catholic Institute for Evangelization (1993-2002), Pastor of Saint William Parish, Philadelphia (2002-2009), and Pastor of Saint Agnes Parish, West Chester, PA (2009-2012). His work in education included teaching courses in psychology and religious studies at LaSalle University, Philadelphia (1994-2008). Bishop Perez also taught Developmental Psychology at Saint Charles Borromeo Seminary (Fall, 2011), in the Archdiocese of Philadelphia. In 1998, he was named Chaplain to His Holiness, Pope John Paul II, with the title of Monsignor. In 2009, he was named a Prelate of Honor by Pope Benedict XVI. 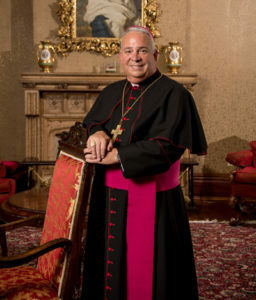 Pope Benedict XVI appointed Reverend Monsignor Nelson J. Perez Auxiliary Bishop of the Diocese of Rockville Centre in New York on June 8, 2012. He was ordained a bishop on July 25, 2012 in Saint Agnes Cathedral, Rockville Centre, NY by Bishop William F. Murphy. This entry was posted in Luncheon Speaker, past events on November 8, 2017 by suejosecretary.